A pretty enjoyable and funny movie about the most unlikely hero and the journey he ends up going on. This is a very funny and unique movie. It’s about an obsessive compulsive, lousy person who does whatever he wants, and doesn’t seem to understand how or why his behavior would be considered rude by the rest of society. 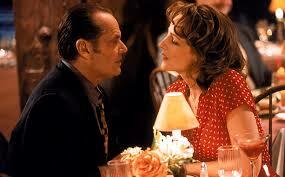 As the movie goes on, this character, Melvin (Jack Nicholson), changes little by little. It takes time for him to change and realize that he doesn’t have to be such a jerk to everyone, and watching the things that cause these changes, such as him having to take care of a cute little dog, are a lot of fun. The movie has great characters and wonderful interactions between these characters. The humor switches tones, going back and forth between adorable and offensive, and all of it is designed to keep us from knowing what will happen next. This is a very smart movie about one character in particular, who is unlike any other main character (or at least romantic love interest) that has ever been on screen. As good as it gets is something different. It’s a romantic comedy about a guy who is obsessive compulsive, and a terrible mean person. 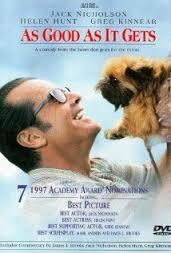 Only this character, Melvin (Jack Nicholson), is only horrible in that he doesn’t seem to know any better. He does and says awful things to people, but his mind doesn’t seem to process that he is doing wrong until after it is too late. In addition, as far as the romantic comedy part, that only comes in at the very end of the movie, with most of this film being about the character and not the romance. The movie is completely character driven to the point where it doesn’t have that strong of a plot, and as it happens, that’s a good thing. We don’t need a lot of twists and turns and subplots and side characters for a movie like this. There are three main characters and two real side characters and that’s about it. In addition, that’s really all you need if those main characters are interesting enough. It’s no surprise that both Helen Hunt and Jack Nicholson won Oscars for this movie, because it is their performances, as well as Greg Kinnear’s (who was nominated, but did not win), that really bring the movie to life. At the start of the film, we are following a cute little dog around the hallways of an apartment building, and watching Melvin come out of his apartment to catch the dog, ready to urinate on the hallway wall. Melvin tries to negotiate with the dog and talk to him, and almost succeeds, but in the end, the dog is going to do what he wants to do. This scene is very funny, and it ends with Melvin grabbing the dog and dropping him down the garbage shoot. And just like that, we are hooked. Especially when the neighbor, Simon (Kinnear), comes by asking Melvin if he has seen the dog, and Melvin lies about it. Not only does he lie, but also he screams at Simon for disturbing him while he is writing. The movie is very smart in the way it shows us Melvin’s point of view, so that he don’t hate him for being so mean. When he was dealing with the dog, we saw his point of view as he was pleading with the dog not to urinate on the wall. And now, we are with him in his apartment, listening to his voice over about the thoughts that are going through his head, and how he is trying to figure out the wording for his story. It’s a struggle to get it just right, and when he finally does, there is a loud knock on the door, making him lose his idea. It’s very funny, and we get to see it happen twice. The second time is when Simon’s art agent, frank (Cuba Gooding Jr.) shows up to give Melvin hell about the way he just treated Simon. The character, frank, is one of the only people who can really get through to Melvin, and that’s because he gets tough with him. He’s an important character throughout the movie, as he is the one who gives Melvin the push over and over again to do things that he does not want to do (take care of the dog, drive Simon to another state.) Frank is one of the two side characters of the movie, and the other is Carol’s mother, who helps take care of her son. But before we can meet her, we need to meet Carol. Carol (Helen Hunt), is the waitress who works at Simon’s favorite restaurant. On top of that, she’s the only waitress who he will allow to serve him at this restaurant. We never really learn why that is, but maybe it’s because of something that can’t really be put into words. After all, Melvin is obsessive compulsive, to the point where he won’t step on any cracks, and touches things like the lights and the door, over and over again, a certain amount of times, before moving onto the next thing. We see Melvin at the restaurant, using insults to get people who are sitting at “his table,” to leave. Then when Carol comes over to talk to him, he doesn’t realize what he’s saying, and ends up saying something awful about her sick son. He tells her that it sounds like her son is going to die soon. At this point, Carol threatens him. All of this is really introduction material to see how much Carol hates him at first, and also to learn about her sick son. The storyline really gets moving when Carol doesn’t show up to work one day, and Melvin goes to her apartment to see why she isn’t there. When that doesn’t work, he hires a doctor to come to Carol’s house and run all kinds of tests on her son, to find out exactly what’s wrong with the boy and help him start feeling better. This is the first kind gesture that Melvin does, and despite him doing it for selfish reasons (he wants Carol back at the restaurant so that she will wait on him), it’s still something new that we see in his character. Other factors come into play that starts changing Melvin into a better person as well. When Simon is attacked, frank, the art dealer, convinces Melvin to take care of Simon’s dog. And that relationship becomes very funny and cute as both he and the dog grow incredibly fond of each other. And then when Simon needs to go out of town to see his parents, frank convinces Melvin to be the one who drives him. Melvin goes to Carol and asks her to come, since he helped her with the doctor situation, and suddenly we are headed out on a road trip. What I love about this movie, more than anything else, is that even when it seems like the stars are lining up, and like a relationship is forming and things are about to work out, even then, Melvin says something so terrible that he blows the whole thing. There’s one great moment at a restaurant towards the end of the movie, which is my favorite moment in the film, as Carol asks Melvin what he expected to happen, and he responds with something that nobody ever saw coming. This is a creative movie. On the surface, it is very simple, with only a handful of pieces and characters, but it ends up going in some much-unexpected places, and having a lot of fun getting there. The humor is a major factor in this movie, often alternating between cute and offensive. It keeps us guessing and keeps us on our toes, and it’s always great when a movie can do that to an audience.